Gov. Ricardo Rosselló addresses participants of the Puerto Rico "Emprende" Academy's opening event. Gov. Ricardo Rosselló addresses participants of the Puerto Rico “Emprende” Academy’s opening event. Gov. 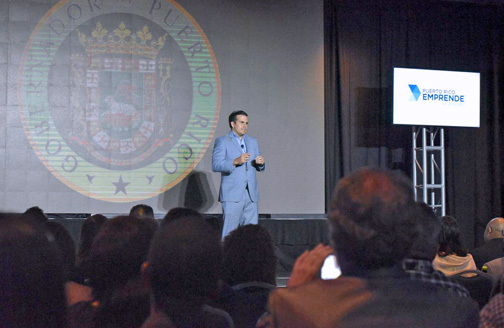 Ricardo Rosselló announced Wednesday the creation of the Puerto Rico “Emprende” Academy, an initiative aimed at developing a “strengthened, streamlined and innovation-oriented Puerto Rican entrepreneurial class. “The creation of this initiative responds to a need to unite the efforts of the public and private sectors to meet the needs of small and medium enterprises wishing to improve their productivity and competitiveness,” Rosselló said. “In this way, we strengthen the foundations of our economic development,” he added during a presentation at the Puerto Rico Convention Center. The goal of the Puerto Rico “Emprende” Academy is to empower the community by instilling an entrepreneurial mindset that seeks to constantly innovate and progress, “achieving productive value to our local economy,” said Puerto Rico Trade and Export Company Executive Director Ricardo Llerandi. A total of 35 companies will be selected to participate in the Puerto Rico “Emprende” Academy, and will receive training, tools, advice and incentives to develop their businesses. The six-month program comprises four phases: recruitment, coaching, financing and graduation. Upon completion, the companies will have their own micro-enterprise X-Ray and estimated short- and long-term growth projections. Close to 225 entrepreneurs attended the opening event and participated in a training workshop where issues of empowerment, knowledge of business and finance were presented. Puerto Rico “Emprende” is Puerto Rico Trade’s business platform that brings together different existing and newly created initiatives, and its main objective is to promote greater opportunities for the development of more local businesses to create jobs and compete locally and abroad, government officials said. Hey Buddy!, I found this information for you: "Puerto Rico ‘Emprende’ Academy kicks off to promote entrepreneurship". Here is the website link: https://newsismybusiness.com/rossello-emprende-inaugurated/. Thank you.